Just how far will a Christian go to dodge their burden of proof? 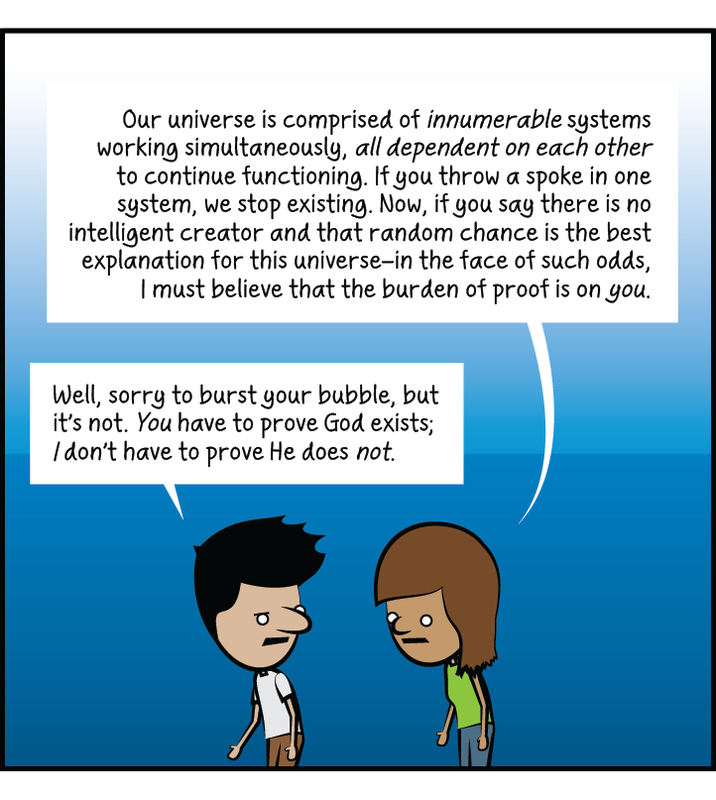 I've posted before on the "mixed up burden of proof" and the problems that religious people have with it. I've said before that the burden of proof is always on the person making the claims. And yet, religious people just don't get this very simple concept. It's come to my attention recently that once again people - especially Christians - are attempting to shift this burden of proof from the claimant to the respondent. Part of this seems to be due to a persistent "Atheism is a religion" meme. This is the idea that atheists take the non-existence of a deity on faith, not on evidence, and therefore atheism is no different than a religion. I'll freely admit that there are atheists who deny the possibility of any deity or deities. And I'll agree that they do so on philosophically shaky ground that leaves them as vulnerable to the charge of "faith" as any religious adherent. This is exactly why atheists have pointed out the difference between so called "weak atheism" and "strong atheism", or the differences between explicit and implicit atheism. Personally, I'm an explicit, "weak" atheist. I have never found enough evidence to convince me that at least one deity exists, and so I live my life as if no deities exist. However, I could be wrong. All it would take to convince me that I'm wrong is sufficient evidence. And if I received such evidence that at least one deity existed, I would change in a heartbeat to live my life as if a deity existed. This willingness to change one's mind when presented with evidence is not a hallmark of religion. 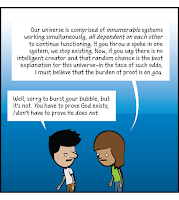 I recently ran into a cartoon by Christian web cartoonist Adam4D, which demonstrates this frantic attempt to shift the burden of proof of God from the Christian to the atheist. The cartoonist then segways to a teleological argument using the Watchmaker Analogy. Of course this argument has multiple problems. As pointed out by judge John Jones in Kitzmiller v. Dover, the argument from design is subjective. Even Professor Behe couldn't show that there was any real way of determining something was created through a natural process or through a divine process - only that it "looks complex". In other words, it was only through subjective terms that a Christian can claim that a tree is divinely created and a snowflake is not. Here you will see that the username "cousinoleg" has asserted that there are only three positions that one can take in regards to a claim. These three positions are either ignorance of the claim, acceptance of the claim, or denial of the claim. This has left cousinoleg in a very vulnerable position in this discussion. This method is not very reasonable. The reaction to a positive claim might not be denial that the claim is true, but merely an assertion that the respondent does not believe the claimant. Or a positive claim could be met with a counter claim that invalidates the first claim. If it is not the claimants burden to prove that what they say is true, then a counter claim will automatically annul the original claim until it is proved false. For example, let's take Adam4D's original cartoon, and modify it, for educational "Fair Use" purposes. Click here to see this modified cartoon enlarged. Here we can see that if the claimant denies his or her duty to prove their claims, then those claims are immediately subject to being countered by an opposing claim - that also is not required to be proved. 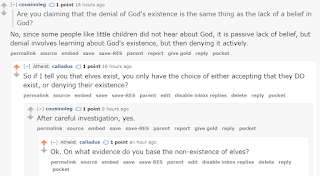 More simply put, my claim that invisible elves exist disproves your claim that a God exists. 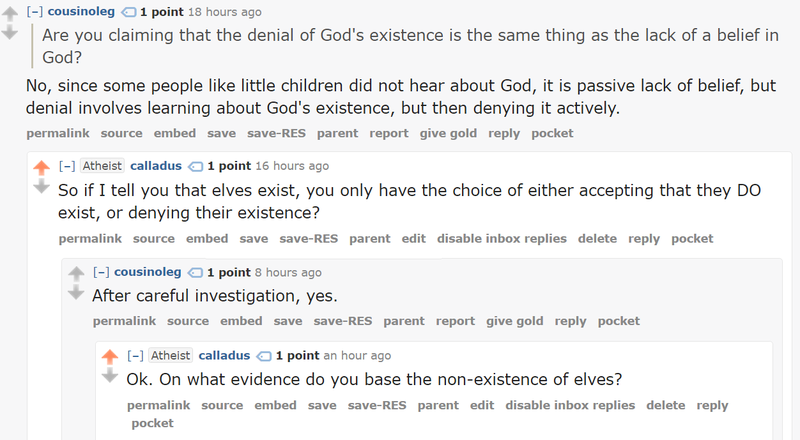 If you are not required to prove your claim of a God, then I am not required to prove my claim of elves. "What can be asserted without evidence, can be dismissed without evidence."